If you had been thinking of getting a ticket for the Piedmont Goes Green parent party, but never got around to it, this is the LAST, LAST minute (the party is this Saturday). We have just a few spots left. Let me know a.s.a.p. if you’re interested. Aside from the fascinating presentations, we are going to have a great menu of organic, local and seasonal dishes. Shannon Bloemker (Havens parent). Home Remodeling for Sustainability: Being eco-friendly isn’t all there is to making your major or minor home remodel sustainable. It’s about a balance between finances, social well-being, and the environment. Guidelines for thinking through your project to make your home greener and more sustainable, as well as the myths and realities of LEED certification. ( Shannon is getting her Master’s in Sustainability and Environmental Management from Harvard, and is certified in LEED). ALSO FEATURING: Stella Kennedy (PMS Green Team teacher) with plants and information from the U.C. Botanical Garden Native Plant Nursery. This entry was posted on October 5, 2010 at 10:36 am	and is filed under School. 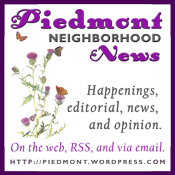 Tagged: beach goes green, Piedmont Goes Green. You can follow any responses to this entry through the RSS 2.0 feed. You can leave a response, or trackback from your own site.